She did it again – wow this gal is good! An even better follow-up, with songs celebrating the gift of life (in response to the then-recent Supreme Court decision on abortion). Now she’s reminding me a little of Marj Snyder. A simple and pure folk sound with acoustic guitars, electric bass, cello, bells and drums. I even dig the two live songs with the eight kids known as the Lollipop Express Chorus (‘Hold My Hand’ and ‘Joy In My Heart’). Mostly original songs, plus a cover of ‘He Ain’t Heavy’. 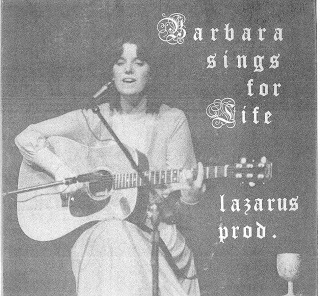 The outstanding track would have to be ‘Song Of The Unborn’ – an eerie lamentation expressing longing for life from the perspective of an unborn child, sung, hummed and hauntingly murmured by Barbara while backed by minor-key dulcimer and the sound of a heartbeat. Also some beautiful delicate acoustic ballads, specifically ‘Life Is Like A Carousel’, ‘Echoes’ and ‘Song For Life’. 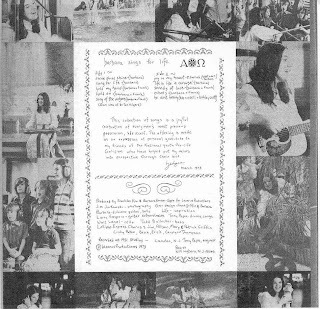 The latter song was selected for Wayfaring Strangers: Ladies From The Canyon, a 2006 compilation CD of obscure female folksinger private press recordings. (The Archivist, 4th edition by Ken Scott). I’ll try to track down her first. All I can say is Wow! I am not surprised that Barb was able to transition to opera, given her range and absolute pitch with just the right vibrato. Marj Snyder, Linda Rich and Barb Sipple were a cut above. I just love their work. Can anyone recommend anything else in the same vein?